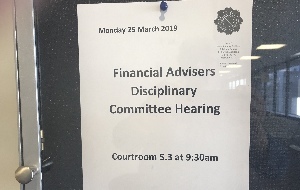 The Financial Advisory Disciplinary Council, (FADC) yesterday, prosecuted its first case against an insurance adviser over non-disclosure issues. The Financial Markets Authority alleged an Auckland-based insurance adviser failed to disclose pre-existing medical conditions on two client applications. FADC chairman Bruce Robertson suppressed the name of the adviser and the two clients who gave evidence at yesterday's hearing in the Auckland District Court. While the original claim was that the adviser had breached Code Standards 12 and 8, FMA counsel withdraw the former allegation and submitted the case was centred on CS8. He alleged the adviser had not kept good records, but withdrew the charges around CS12. FMA counsel also acknowledged that this was "not a high end case." "It's at the lesser order of seriousness," he said. However, it was still a "significant consumer protection issues at the heart of it." Because of the non-disclosure of pre-existing conditions the first witness had bought a useless policy, he said. The first witness originally bought a Sovereign policy through ASB then switched to a Partners Life policy after taking advice. Counsel for the adviser claimed the policyholder had failed to disclose various medical incidents including operations on his arm nearly 40 years ago. However, the client said he hadn't been asked about his previous medical history when the application was being completed. He said he didn't remember going through the 30-plus page application in details. "To be fair I don’t want to," he said. "My broker should look after it." A second client also gave evidence. More details to follow. The FADC has reserved its decision. Is this a case about churn or about non-disclosure? These ar two different things! I'm the adviser involved here. Both clients filled out their application from cover to cover in their own handwriting. The Adviser. I am a bit confused here. I lodged a complaint, where the adviser fully completed the personal statement, without the client being present, and this resulted in a total of 12 material non-disclosures. The FMA have not prosecuted, and refuse to let me know what action they took. This same adviser sold their client base to an unsuspecting buyer who has spent hours and hours renegotiating terms for his clients to address a number of non disclosures he uncovered. I can only assume that you were caught up in the Churn Investigation, and the resulting prosecution has been made to try and vindicate the FMA's actions. CS8 is Agreeing Nature and Scope of Service. WTF does that have to do with non disclosure? Ron, I’m guessing the adviser was an RFA? I don’t believe the FMA will do anything to an RFA unless it’s downright illegal conduct. All Hat ... ask away. This was Code Standard 8 as at 1Juky 2014 This became CS9 in the 2016 variation. I/m guessing the adviser is/was an RFA? I don't believe the FMA will do anything to an RFA unless it's downright illegal conduct. This was CS8 as at 2014 - became CS9 in 2019. Agree, many questions. And the adviser concerned being here to comment is helpful. Though to be clear we are talking about an AFA adviser and not a Registered Financial Adviser? As the AFA code of conduct doesn't apply to RFA's. Given the comment above that, the application is exclusively in the client's handwriting, should also add to the adviser's defence. As completing the application, suggests the client had to read the questions. Though there are ways to guide a client through the application without the client reading it... So we do need to be careful about how we manage this. Was there a copy of the application provided to the client post meeting? And did the client confirm that they had read it, understood it and confirmed/not confirmed any changes? If they had provided anything additional post-meeting that was off the back of receiving the copy, then this too is evidence to support the adviser going through the right process to get the disclosure, and the client has either forgotten the details, has intentionally withheld them or, is just slack with their medical history. The Adviser In this FADC, not knowing any more detail than what has been said here, good luck with the case, hopefully, they manage it fairly and they come out with the right decision. @Ron, your experience isn't too dissimilar to many I have heard. The FMA team adds it to the pile and carries on. It may be the RFA vs AFA thing, where the FMA has little in the way of real levers to chase the complaints with RFA's. JPHale - "Was there a copy of the application provided to the client post meeting?" Unfortunately that wasn't part of my process back then as they were all builders and weren't great at answering emails - but I have been doing that for the last 3 years. Perhaps another important point is that Client1 very blatently non-disclosed in almost the same way in his previous ASB application - 18 months before meeting me. He completed that application one week after he attended a very serious doctor’s appointment. He signed and non-disclosed all major health issues to ASB while still investigating his health condition. None of this was picked up by the FMA when they were investigating the case (over two years) even though they had the clients medical records & the ASB application from the very early stages. When we pointed this out in our submissions the FMA were not at all phased. When Client1 applied for health insurance with me nearly a year after his first application with me he failed to disclose that he had been admitted to hospital with the same serious complaint he was investigating earlier. Both clients received a 50 page statement of advice. Both clients involved in this case work together. The clients have claimed that I didn't take them through the application thoroughly enough and Client1 even claimed I completed his form and told him where to sign. The entire application is in his handwriting. Unfortunately we were applying for cover with a company that only asks you to tick the box if your answer is 'yes'. If your answer is 'no' you leave it blank. This leaves advisers open to later claims that they didn't do the job properly if a client non-discloses. Yes, it is an RFA, and it appears the FMA is "toothless" when dealing with complaints against RFA'S. What is also disappointing is the adviser joined, and is still a member of, Financial Advice New Zealand, without declaring that they had been the subject of a complaint against them. How can we ever hope to clean up this industry when Advisers like this are still in it. @Ron, Yup. And this is something the FMA has said publically. They have little in the kit bag to pursue RFA's under the current law. They know it and are waiting for the new legislation to come through so they can then take action on the pile of complaints they have. The interesting thing is those advisers that have been subject to FMA complaints that have gone nowhere, they haven't got away with it, they're top of the list when the new law comes in. And the first sign of this is going to be the transitionary license process where the fine tooth comb comes out and they will be subject to the hourly rates charges significantly higher than we would normally expect. These advisers will be some of the ones complaining about the excessive bureaucracy to get their license if they get one at all. That's going to be hurdle number one. Thanks for the clarification The Adviser In this FADC. I feel your pain on this one as there's much with this that is patently unfair against the expectations of the day. Not to mention the clear disparity of the applications being in the client's handwriting which to the normal person would demonstrate that they had to at least read the questions. If they didn't understand them, ok, that's an issue, but also one where the client has the responsibility to ask questions and clarify. What I see with what I have seen to date is a situation that has removed any measure of responsibility from the client and completely undermined the client requirement to demonstrate good faith with our insurance laws. And this concerns me. JPHale... Unfortunately it's worse than that. The FADC recognised that Client 1 (Mr W) was actually intentionally non-disclosing to me and the insurer because he knew he wouldn't get cover otherwise. However, they think that because I accepted the clients position that he didn't have a back issue and refused to declare it that I breached the code. I think the FADC has taken a rather expansive interpretation of the 2014 CS8. They have chosen to reinterpret 'Risk Profile' to mean something other than an investment term. Because I knew the client had a back exclusion on the previous policy I should have ignored the clients explanation and made other enquiries - like contacting the previous insurer. Had I obtained the earlier application I would have been none the wiser because he minimised the issue on that form also. He also minimised the issue again on the stand saying that he'd just tweaked his back hanging a curtain - a one-off situation that had never occurred before or after. The guidance notes for CS8 (2014) say that I can rely on what the client tells me or facts that I otherwise know. The 'otherwise know' is where I have been caught. The adviser in the FADC case. It is a pity you didn't walk away from the client, once he made you aware he had a previous back exclusion, and advised you not to document it. You could have saved yourself a lot of grief. The Adviser in this FADC case claims that (a) he knew the client had a back exclusion on a previous policy, (b) that he should have ignored the client's explanation of the back exclusion and made further enquiries with the previous insurer, and (c) that even if he had made these enquiries it would not have helped explain the exclusion because the client had minimised the seriousness of the back condition on his previous proposal. On the application form, where it asks the client to "Provide details of any applications you have made for any life, trauma, disability or medical insurance benefits which were declined, deferred or offered with special acceptance terms", ensure that the client answers "Yes" and provides the relevant details of the exclusion. Leave it up to the underwriter to make further enquiries,that is their job not yours. And it is most certainly not your job to decide whether or not the client SHOULD answer Yes to that question based on what you make of the available evidence. Where the client instructs you to answer No to this question, then recognise that this is an egregious case of non-disclosure and refuse to submit the proposal. Or: Roll the dice, submit the proposal, and bank the commission. To Adviser in the FADC case. As i read the FADC decision and on the facts reported there, it is clear advisers have duties even though their clients may be acting dishonestly. Trivial or not, as you knew about the previous exclusion you were duty bound to advise the new insurer. This duty comes not from CS8 but from the Insurance law. I can't recall the relevant law but adviser knowledge is deemed to be insurer knowledge for application purposes. The fact the client non-disclosed so much more than the back exclusion may be a blessing in disguise for you, becuase if the back was the only issue and the second insurer was forced to pay a claim they would otherwise have declined for non-disclosure, they could be asking you to stump up with the cash. This is a critical piece of law and I am constantly dismayed at how few advisers understand it or the potential consequences. Paul Flood & Tash. I think this is a good assessment of the one mistake I did make with Mr W (Client1). As soon as it was pointed out that the "ever had cover declined or deferred" also asked if cover was offered with special acceptance terms I agreed at the FADC that I should have had the client answer 'yes' to that question. Had it happened the insurer would have investigated further and his long list of serious health issues would have been discovered. I might have missed out on a commission but would have saved a PI claim of $80,000 (including a $5,000 excess). Mr W falsely alleged that I completed his health statement and asked him to initial and sign where I indicated - missing all of his disclosures. When the FMA was told this (via the client's new adviser) they commenced an investigation into hundreds of clients and it all boiled down to this client and his co-worker. Paul Flood & Tash - I'd be interested in your take on Mr P (Client2). The RFA, now with Mr W's accusation in his kit bag went to a large number of my clients to tell them about 'the situation' and then set about moving them all to another insurer. With Mr P he managed to wring out that Mr P had a heat rash, rolled his ankle and had a couple of cuts in the previous 6 years. I understand he got this by pulling the client's ACC records. Using this information the adviser told the client that his current policy could be cancelled for non-disclosure and moved him to another insurer. The RFA also told Mr P that he had exclusions on his new policy when he did not. Mr P said my 2 appointment process was rushed compared to the RFA's single appointment lasting 90 minutes. The FADC weren't swayed by the fact that I actually signed him up after a third appointment. FADC seems satisfied to accept the 'rushed' description simply because the new Adviser was able to obtain a disclosure that I didn't. Would you be confident that if you took 100 client's through an application that there wouldn't be a few that failed to disclose a heat rash 4 years earlier?